The southern city of Adelaide, Australia is home to many attractions, both cultural and natural. One of the city’s most eye-catching attractions however is mounted to the facade of one the most unremarkable structures of any city, namely a parking garage. The Rundle Lantern, as it is called, is nine levels high and covers almost 11,500sqft of the parking garage’s exterior. 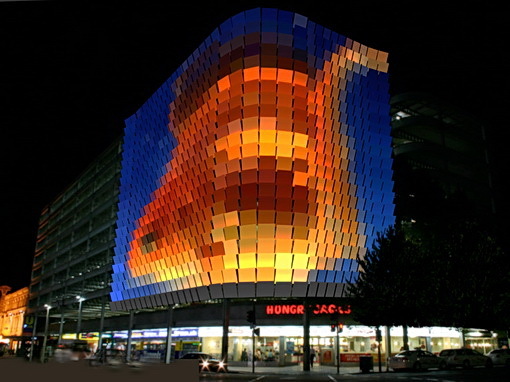 The Rundle Lantern is composed of 748 screens, or “pixels”, that wrap around the building, creating a very unique canvas for light and animation. The Lantern is powered by 1,496 LED lights (two behind each screen), that are fully addressable and controlled by a central computer outfitted with animation software. Interestingly, the Rundle Lantern displays no text or brand logos, but displays only static or moving colors, creating a vibrant and colorful center in the city that can be enjoyed by all. To make the Rundle Lantern even more captivating, it uses very little energy while produce large amounts of light, reaping the full benefits of LED technology. The Rundle Lantern is one of the most well done and imaginative applications of LED lighting in the world. Furthermore, the use of LEDs in this application demonstrates how the versatility of LEDs can be used to turn any unremarkable structure into a beacon of light, color, and excitement. Don’t forget to check out BulbAmerica’s comprehensive catalog of LEDs! From LED lighting effects, PAR cans, and outdoor LED PARs and washes we have everything you need to shine and more! Don’t forget to leave any further comments or questions on our blog or Facebook. You can also call us at 1-877-622-0897.